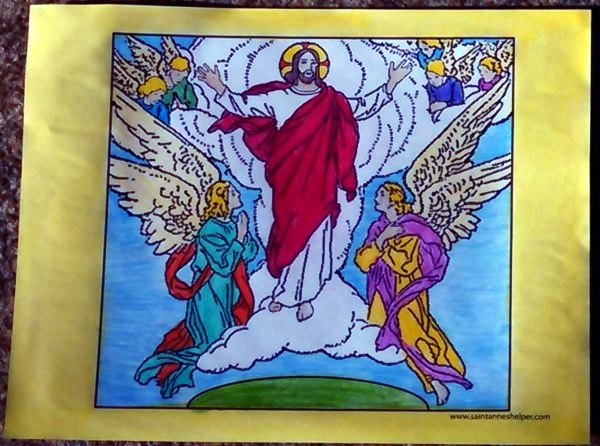 Paint or color this coloring page of Jesus' Ascension. 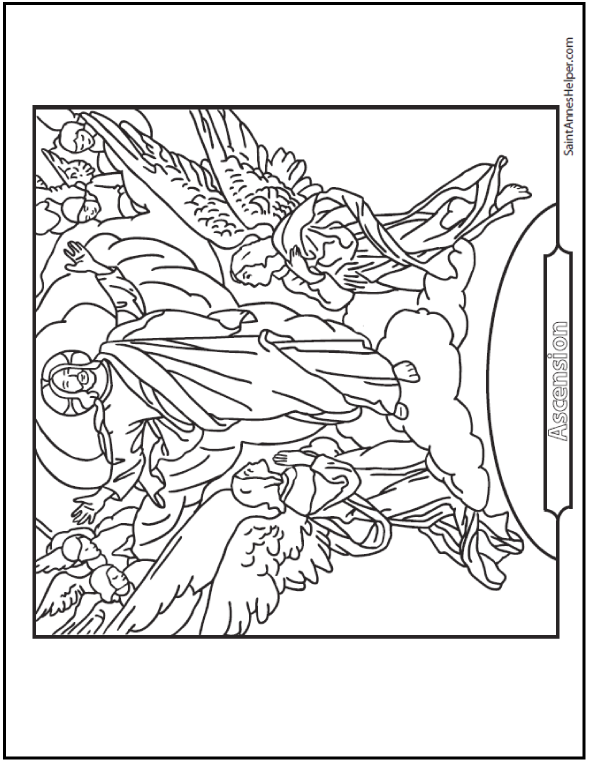 This Jesus Ascension coloring page shows Jesus with angels adoring Him as He ascends into Heaven. Ascension Thursday is 40 days after Easter and 10 days before Pentecost. 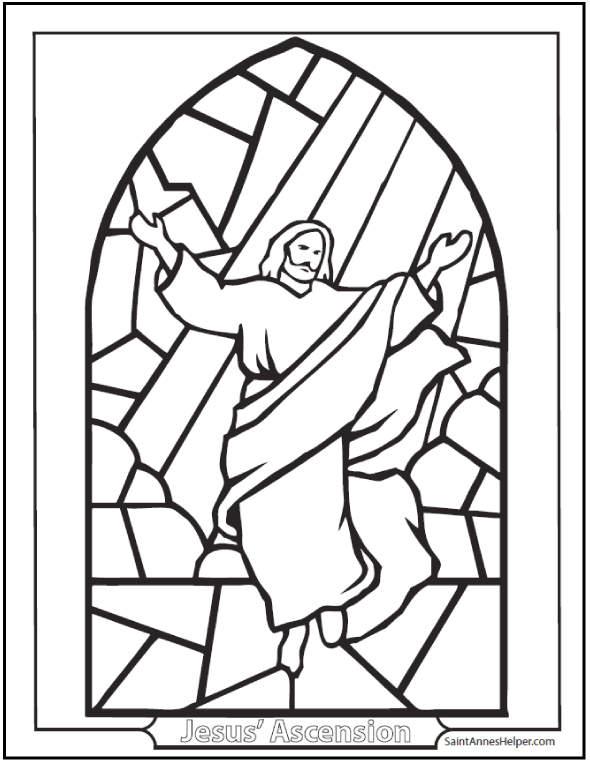 Teach the Fourth Glorious Mystery: Jesus Ascends into Heaven by His own omnipotent power. Do you do the Rogation Days? They are the three days before Ascension Day. These PDFs print at 8.5x11" single sided. The Sunday before Ascension Thursday, or the Fifth Sunday after Easter, is called Petition Sunday - when we ask God for many things. The next three days are the Rogation Days, then comes Ascension Thursday - a Holy Day of Obligation that the Baltimore Catechism teaches is forty days after Easter or ten days before Pentecost. If you want to add umph to your business, farming, or garden successes this is the week for you! The Catholic Church asks for blessings on the crops during these days. 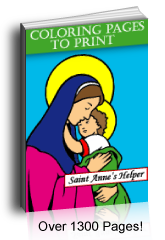 This next is a story from the Pictorial Lives of the Saints, with Reflections for Every Day in the Year (Amazon), compiled from Butler's Lives and other Approved Sources. Imprimatur, 1878. The mystery which the Church honors on this day is at the same time that of the triumph of Jesus Christ and the hallowed hope of His disciples. The Saviour, after having accomplished His mission on earth, ascends to heaven to put His manhood in possession of the glory due to it, and to prepare for us an abiding-place. He ascends thither as our King, Liberator, Chief, and Mediator: our King, because He has purchased us at the cost of His blood; our Liberator, because He has conquered death and sin, and has ransomed us from the thraldom of Satan; our Chief, because He wishes that we should follow in His footsteps, and that we should be where He is, even as He has Himself declared; our Mediator, because we can have access to the Father only through Him. He ascends thither as our High Priest, in order to offer unceasingly to God the blood which He has shed for us in His character of man, and to obtain for us through the merits of His sacrifice the remission of our sins. Let us, then, by means of faith, follow Him in His Ascension to heaven, and abide there henceforth in heart and spirit. Let us remember that heaven is wholly ours, as our inheritance; and, amid the temptations and miseries of this life, let us think often of this home of peace, of glory, and of bliss eternal. We must not flatter ourselves, however, that without earnest efforts on our part we shall have any share in the kingdom of Jesus Christ. There are many mansions in the house of our heavenly Father, but there are not many roads leading thither. Jesus Christ has traced out for us the way of humiliation and suffering, and it is the only one that conducts to eternal peace. If the hardships of the journey and the sight of our own weakness strike us with dread, we should gather energy by leaning on the promises of the God-man. He will be with us even unto the end, and if we love Him all will become easy. Reflection.—Let us cherish hope: "Christ being come, a High Priest of the good things to come, hath entered into the holy of holies, by His own blood having obtained eternal redemption." The Glorious Mysteries are very related to Easter, the Ascension, and Pentecost.